SolidFramework.dll is what you require to do PDF to Word conversion and PDF modification. If you would like to create PDF files from other file formats, you will need to install Solid PDF Creator. Use the download link from the Downloads tab on the Solid Framework Developer Portal to get the correct version. You don't need a license for the PDF creation printer drivers: they simply inherit your Solid Framework license automatically. After completing your download place SolidFramework.dll in the source folder of your project. Add a reference to this assembly from your project, Click here to see video tutorial. To use the Solid Framework features you must embed the location of your license in your code Click here to see the video tutorial. 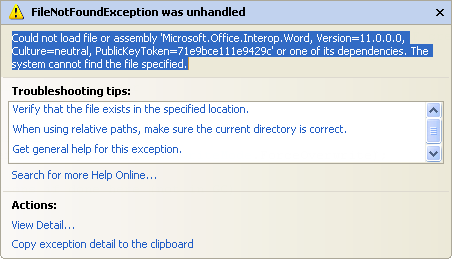 When running your application for the first time, you may get an exception similar to the one shown here. This happens when Solid Framework attempts to use Office from the WordPrintProvider<T> class. This message may appear for the first time when you attempt to deploy to a production machine that does not include Visual Studio. Visual Studio uses a private set of primary interop assemblies for Office. This can cause unexpected problems when deploying your solution to an environment that does not have Visual Studio installed. For specific instructions on acquiring and installing the redistributable installer, please read this MSDN topic.